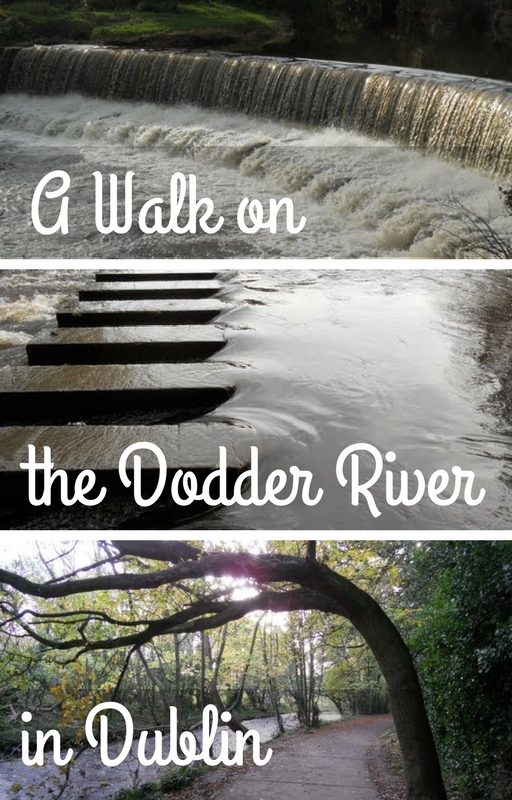 The River Dodder offers an irresistible challenge for someone that likes to walk as much as I do. The Dodder meanders along for about 5 miles on Google maps from the Port of Dublin to Rathfarnham. At this point, it appears to end mysteriously. 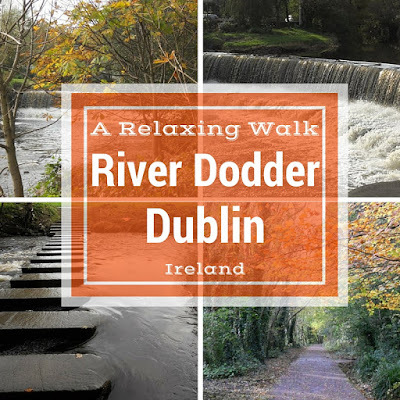 We took advantage of a rare sunny and unseasonably warm Fall day in Dublin to hike along the Dodder River from Ballsbridge to Rathfarnham. The Dodder keeps up a strong current and was roiling as we walked along. There is a well-marked walking path sandwiched between the Dodder and Herbert Park Hotel in Ballsbridge. SIDEWALK SAFARI SPOTLIGHT: Dublin is full of amazing walks and other things to do. Check out our huge list of one day Dublin City itineraries to inspire a day out. We descended a set of stairs and walked at water level. I liked these chalk fish bones that we discovered on our Dodder River walk. We were walking along when we suddenly saw a *huge* heron perched in the woods along the Dodder River Path. We stood motionless and watched this gorgeous animal for more than 5 minutes before continuing on our way. It was amazing that were able to get so close! Our walk took place just a couple weeks after heavy rains and flooding had plagued Dublin. The Dodder actually spilled over its banks in parts. We could see quite a bit of plastic and fabric strewn in the trees along the river. We came to a lovely footbridge over the river. We ventured mid-span and watched the Dodder rapidly flowing in both directions. We continued our hike and soon approached a small multi-tiered waterfall. Across the street from the Dodder River were some lovely houses with colorful doors. Small mysterious engraved stones appeared along the Dodder footpath at irregular intervals. The foliage along the riverbank soon grew thicker. We emerged at an abandoned factory. Walking further along the River Dodder, we saw a beautiful dark wood building that houses a law firm. The path became more cultivated in this area as we entered 'The Dodder'. A well marked path with orderly lanes for walkers and cyclists guided our hike along the Dodder river trail. The Dodder was running pretty low at this point and bubbling over the exposed rocks. In the distance, we could see another victim of the Dodder flooding -- this car thrown onto the river bank. Nature is a powerful thing...no doubt. We passed another gorgeous waterfall along the Dodder. We actually passed under the Luas tracks near Dundrum. We'd walked a fair distance up until this point but still felt we had some energy to spare and continued our hike. The footpath along the river was covered with trees whose leaves were changing colors. We chanced upon a surprising sight, this rhino, parked smack in the middle of the Dodder River! He seemed to be associated with a local pub. The water continued to cascade past and then we found a quiet, idyllic spot to have a picnic lunch. We ate on this bench installed thanks to the Dodder Valley Association. We watched dogs frolic past with their owners. Fed and watered, we continued our Dodder River walk and the waterfalls just kept coming. In the distance, we saw an unnamed memorial at a nearby roundabout. The walking trail came just up to the waters edge at this point. We saw more debris from the Dodder River floods hanging down from tree branches. We were lucky enough to spot a second heron near a small waterfall. We soon came to a river crossing. I would call it a bridge across the Dodder, but it wasn't exactly that. It was more like a series of concrete blocks that were easy to skip across. We paused mid-river to watch the water rush by. Phew! We made it to the other side of the Dodder with no problem. We peeked into Bushy Park and admired the swans and ducks swimming lazily. Continuing on the Dodder River trail, we saw this tree bent nearly 90 degrees -- what a cool canopy. The path continued into a heavily wooded area highlighted with bright foliage. We could still see the Dodder through the vines. Contrary to what Google Maps would suggest, the River Dodder doesn't really disappear in Rathfarnham. However, we'd decided that we'd gone as far as we were planning to go that day and called it quits. We popped into the Rathfarnham Shopping Centre and discovered Swiss Deli. It was a good old fashioned coffee shop that sold nice cappuccinos and sweet muffins in a huge variety of flavors. We tried one that was raspberry with a drizzle of white chocolate. It was a nice reward for a long hike along the Dodder River! Here's a link to a map showing our walking route so you can get a sense of the ground we covered. Are you looking for other ideas of outdoor things to do in Dublin? I highly recommend taking a boat ride to Ireland's Eye off the coast of Howth for an afternoon of birdwatching. North Bull Island is also accessible by DART from Raheny and features some easy hikes plus great scenery and birding. 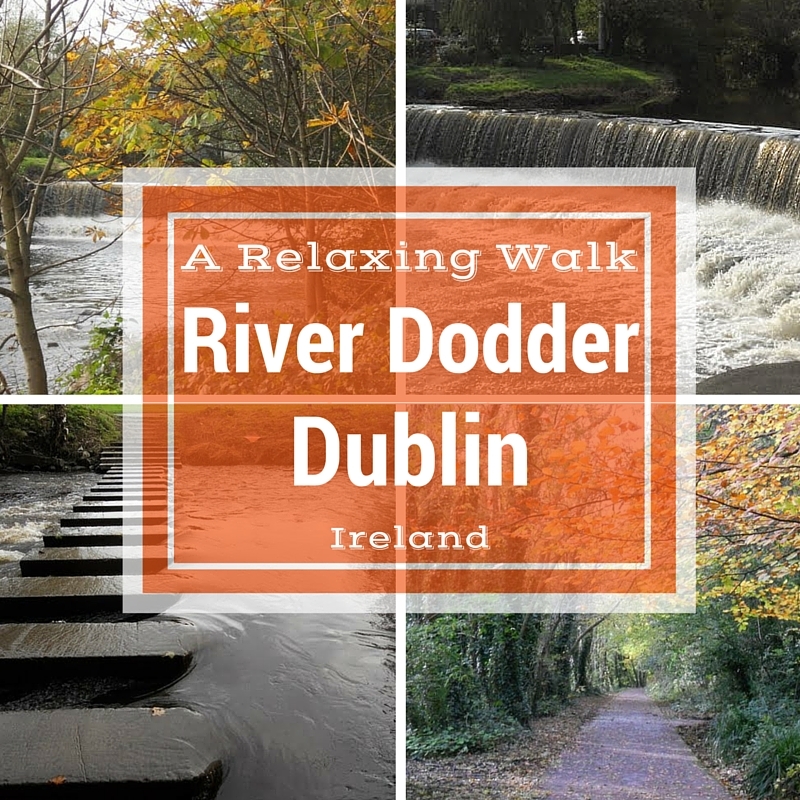 Explore the walking path along the River Dodder in Dublin, Ireland between Ballsbridge and Rathfarnham. A photo-rich post written by Dublin-based travel blogger, Jennifer (aka Dr. J).